How do the leaders operate and how effectively? And the findings are perhaps somewhat surprising. Is HE really that different? Overall, LFHE’s research distinguishes institutional management from leadership, and sees the latter as widely and fluidly dispersed, including, but not limited to, those in formal leadership roles. There is real dispute about who are the leaders with many of those ostensibly in leadership roles not being regarded as such by those they seek to lead. Moreover, for some the “resistance by determinedly autonomous staff is argued to negate leadership.” This makes the HE institution sound like a playground gang or even worse, a political party. 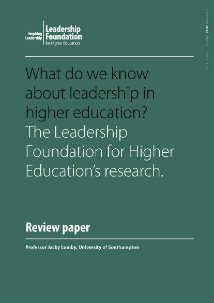 LFHE’s research and the wider literature embodies a yawning divergence in leaders’ espoused values and beliefs about who and what universities are for. This is an outstanding conclusion. This divergence would suggest that universities could never succeed. But they do, despite all their inherent contradictions (including those of their leaders, whoever they are). its practical creation or impact. Summaries of actions other than vision tend to the general and positive, and are in many cases ambiguous. This may be in part a result of self-reported methods and also of generalising across varied roles in different contexts. We know little about the detail of practice. I just love this. It suggests that this visioning is (as per Rozyscki) no more than ‘happy talk’ and that the research is unable to conclude whether this is because the vision isn’t good enough or because the whole vision thing is just ritualistic and illusory. Evidence of the impact of leadership on the extent and quality of research, learning and enterprise is rather slim. and ineffective in the same context. As in the wider literature, the research generates lists of characteristics of effective leaders that are somewhat idealised and apolitical. Oppositional narratives underpin estimates of effectiveness; a rational narrative stresses data-driven, command and control, while an alternative prizes an open- ended and fluid creation of space in which autonomy can flourish. Effectiveness is currently related to individuals, but might be more usefully applied to units. Despite the widespread assertion that leadership is vital, in the absence of convincing evidence of the impact of leadership on higher education’s core activities there is only evidence of the degree to which people believe leadership to be discernible and important or otherwise. The evidence base is unsatisfactory but still suggests that leadership is often, although not always, important. A reassuring message for HE leaders everywhere. A good deal has been achieved in depicting the richness of players and their approaches to leadership. LFHE’s commissioned research avoids reductive over-simplification and provides certainty that there is no certainty about how to act, no rules about what works. Its research on leadership provides stimulation and material for praxis rather than definitive models. What it offers is a contribution to understanding the ecology of the leadership of higher education, so that actions and interventions may be located within a better knowledge base. So, to offer a reductive and over-simplified summary, we don’t know much and nothing is certain but there is loads of interesting stuff to think about. A really nice report and well worth a read. All the relevant research (although I was surprised not to see Amanda Goodall’s Socrates in the Boardroom there) is contained in a handy bibliography too. This entry was posted in Admin, Education, HE, Imperfect University, Management, University and tagged evidence, HE, leadership, LFHE, research, universities by Paul. Bookmark the permalink. Wish I’d had this when I wrote my MBA assignment looking at leadership in Universities – might have got a beter mark! My main conclusion was that Universities need to identify and fast-track what are called hybrid leaders i.e. those who have a talent for leadership but are also very capable in their specialism. They are rare in business but even more so (in my experience) in academia primarily because academics have a particualr skill set which is not often suited to leadership – that is not a critiscism by the way. That said there are a few and they do tend to get recognised – the problem is that they can’t get fast-tracked because they have to go through all the various management stages so it “looks right”. 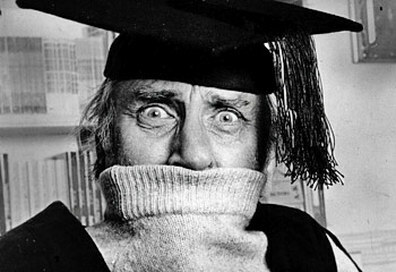 Universities are amazing places and so important but they are too risk averse in my opinion – take a risk on a few good leaders, you never know what might happen ……. Such a fine review, Paul. Although I’m not sure why I like it, or what it will accomplish, or who should learn from it, or what anyone should do with it. But it’s very good, and most obviously very important. I too love HE, and even more, I love reviews about HE.